José Ariel Contreras Camejo (born December 6, 1971) is a Cuban professional baseball pitcher for the Tigres de Quintana Roo of the Mexican Baseball League. He has played in the Cuban National Series (CNS), Major League Baseball (MLB), and internationally for the Cuban national baseball team. On July 31, 2004 Contreras was traded to the White Sox for pitcher Esteban Loaiza. Contreras pitched inconsistently for the White Sox, up until the end of the season. On the last day of the season, he threw eight innings of two hit baseball earning his 13th win of the season. He finished with a 5.50 ERA and 150 strikeouts in 170 1⁄3 innings between New York and Chicago. The 2005 season began with mixed results for Contreras. Contreras started the season with five consecutive no-decisions and an ERA of 3.04, and but pitched poorly after that until the All-Star break, with a 4–3 record. The first game after the break (July 14), Contreras pitched extremely well, beating the Indians 1–0. As the White Sox raced to the playoffs in the second half of the 2005 season, Contreras became Chicago's most reliable pitcher, winning his last 8 starts and on occasion halting the team's losing streaks. One of the main reasons was the way he pitched. With the help of fellow Cuban Orlando Hernández, Contreras began dropping his arm angle during his delivery. Contreras also contributed the 3 postseason victories that tied Andy Pettitte for the most second half victories in the Major Leagues with 11, and he threw his first Major League complete game against the Minnesota Twins, on September 23 Contreras finished the season 15–7 with a 3.61 ERA and 154 strikeouts in 204 2⁄3 innings. 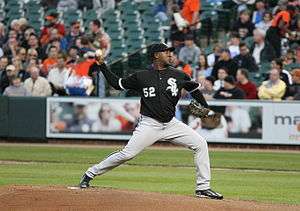 The 2006 season began with Contreras inking a three-year contract extension to remain on the South Side. Contreras started the season as well as he had finished the previous one. 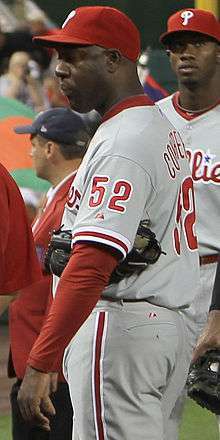 As of July 6, 2006, he was 9–0, with a 3.31 ERA and 71 strikeouts. On June 17, in an 8–6 win over the Cincinnati Reds, José pitched 6 innings and threw a career high 13 strikeouts as he broke the White Sox team record with his 16th consecutive regular-season win, previously held by LaMarr Hoyt (1983–84) and Wilson Alvarez (1993–94). Dating back to the 2005 season, Contreras won 17 consecutive games before finally taking the loss against his former team, the New York Yankees on July 14, 2006. 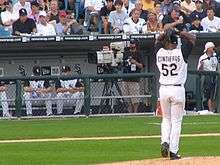 Contreras was named by his White Sox manager Ozzie Guillén to the 2006 American League All-Star team, but was unable to play because he had thrown 6 innings and 117 pitches in a start just two days before the All-Star game. Guillen, the AL manager, replaced him with Minnesota Twins rookie Francisco Liriano. This enabled Contreras to become the first pitcher in 30 years to start 2 consecutive regularly scheduled games. ↑ "Pinar del Rio – Etapa Clasificatoria: 41 Serie Nacional de Beisbol". Granma (in Spanish). Retrieved July 24, 2006. ↑ Justice, Richard (March 29, 1999). "Orioles Leave Cuba With a Win". Washington Post. p. D1. Retrieved March 15, 2013. ↑ "Baseball: Roundup; Cuban Defector Wants to Pitch In Majors". The New York Times. October 11, 2002. Retrieved March 15, 2013. ↑ "Baseball Briefs". Lawrence Journal-Record. Retrieved December 8, 2006. ↑ "Contreras, Yankees agree to four-year deal". Associated Press. Retrieved July 4, 2006. ↑ "Yankees acquire Loaiza from White Sox". Associated Press. Retrieved July 4, 2006. ↑ "Contreras in control as White Sox win". Major League Baseball. Retrieved July 4, 2006. ↑ Kelly Theiser. "Dye, Contreras pair up to oust Twins". Major League Baseball. Retrieved July 4, 2006. ↑ "Contreras agrees to three-year extension with White Sox". Associated Press. April 1, 2006. Retrieved July 4, 2006. ↑ "Liriano, Eckstein Added to All-Star Game". SFGate.com. July 11, 2006. Archived from the original on December 9, 2007. Retrieved July 24, 2006. ↑ "White Sox place Contreras on DL". Yahoo! Sports. August 10, 2008. Retrieved August 11, 2008. ↑ Rogers, Jesse (January 4, 2014). "Frustration mounts". Espn.go.com. Retrieved April 1, 2014. ↑ "Jose Contreras Earns His Way Back Into ChiSox Rotation". South Side Sox. Retrieved April 1, 2014. ↑ "White Sox deal Thome, Contreras". Espn.go.com. September 1, 2009. Retrieved April 1, 2014. ↑ "Phillies bolster bullpen with Contreras". Mlb.mlb.com. Retrieved April 1, 2014. ↑ Salisbury, Jim (October 29, 2012). "Phillies pick up Ruiz's 2013 option, decline Polanco". CSN Philadelphia. ↑ Perry, Dayn. "Pirates sign Jose Contreras to minor-league contract". CBSSports.com. Retrieved April 1, 2014.